Towards the end of the 19th Century, Haslemere had become a desirable place to live, made possible by the coming of the railway in 1849. Among those who came to the district were the poets; Tennyson and William Allingham, the author George Bernard Shaw and Conan Doyle, artists Helen Allingham, Axel Haig and Walter Tyndale, and the surgeon Sir Johnathan Hutchinson. It was in 1894 that Herbert Hutchinson, son of Sir Johnathan Hutchinson, together with a group of local artists decided to hold an exhibition of Arts and Crafts. They formed a committee under the chairmanship of the Hon. Rolls Russell, son of the Prime Minister. Among those on the committee were Charles Whymper, Rayner Storr, Axel Haig, Herbert Hutchinson and Walter Tyndale. The exhibition was held in the New Educational Hall, Kings Road, Haslemere from 3rd to 5th October 1894. The exhibition included works by Helen Allingham, Walter Tyndale, Axel Haig, J.W. Whymper, Charles Whymper, Kate Hopkins and W.C.T. Dobson RA, first President of the Society. Another early member was the local architect J.W. Penfold who was well known for the design of the first letter boxes in 1866. An example of one of these first boxes can be seen outside Royner Storr’s house in the High Street, now the Georgian Hotel. The records of the Society exist in the Minute Books from 1897 to the present day, together with the exhibition catalogues of the Annual Exhibitions from 1894 to 1930 when the name of the Society was changed to the Haslemere Art Society. The object of the change of name appears to have been to attract more paid up members, previously non-members had outnumbered the members at the annual exhibitions. 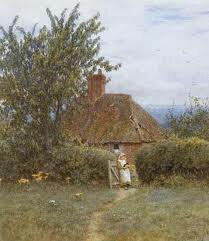 Helen Allingham was famous for her watercolours of cottages. Exhibited with the Haslemere Society of Artists between 1894 and 1903 mainly watercolours of local cottages. 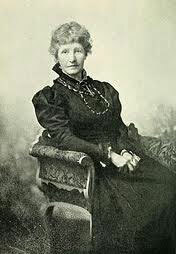 In 18883 she organised a petition to prevent Lord Derby from enclosing parts of Hindhead Common, this led to the formation of the Haslmere Footpaths and Commons Preservation Society. The Allinghams were friends of Tennyson, Gertrude Jekyll and Mengles at Valewood. Mengles introduced Gertrude Jekyll to Edwin Lutyens at a tea party at Valewood. President of the Haslemere Society of Artists 1903 – 1921. Worked for the architect William Burges 1827 – 1881 producing architectural perspectives for him and other architects. Axel Haig designed his own house Grayshurst and Grayswood Church 1902. In the last part of his life he was well known for his engraving, subjects mainly influenced by Gothic Revival. There was a close friendship between Axel Haig, George Bernard Shaw and Sir Arthur Conan Doyle. President of the Haslemere Art Society 1930 – 1932. Founder Member of the Haslemere Society of Artists. He was the third son of Sir Johnathan Hutchinson the founder of the Haslemere Educational Museum. Herbert Hutchinson was an architect who designed several local buildings including High Marley for the renowned Professor of Music Tobias Matthay, the Social Club, College Hill and Keffolds which for a time housed The Bernardo’s Home at the far end of Bunch Lane. First Chairman of the Haslemere Society of Artists 1894. He was the third son of Lord John Russell and uncle of Sir Bertrand Russell. Devils Punch Bowl Hotel which he built as the Thorshill Pension. He did not paint as far as is known. President of the Haslemere Society 1900 – 1903. Self taught artist and engraver. Father of Edward Whymper the first man to climb the Matterhorn in 1865. J.W. Thyper came to Haslemere in 1859 and joined other local artists C.J. Hook and Myles Birkett Foster. These three formed the basis of a group of artists which led to the foundation of the Haslemere Society of Artists in 1894. Son of J.W. Whymper. Watercolours – ornithological subjects. Treasurer of Haslemere Society of Artists. Early exhibition of the Society were held at the new Education Hall near the railway Station in Gashouse Road. The Hall was built by Mr. Storr and seated 300. The Haslemere Natural History Society and Microscope Society used the Hall. Mr. Storr did not paint. President of the Architectural Association. Architect local Buildings: restoration of the Haslemere Parish Church 1870 -71 and addition to Shottermill Church 1876 – 92. Also Rogate Sussex and Thursley Church, Surrey Hospital on Shepherds Hill in memory of his father and Pother. Penfold designed the first letter boxes in 1866. 56 pillar boxes still in existence, one of these may be seen outside the Georgian Hotel. You may know something about the Society that we have left out or you may have some documents or memorabilia that we could photograph and add to the history here. If so please contact Maggie Harker.